Analysis: The Cougars have to decide on a starting quarterback – potentially the last issue WSU thought it would encounter when the season began a few months ago. TUCSON, Ariz. – At the start of the season, Washington State was supposed to be the team rich with offensive prowess, while the Arizona Wildcats were supposed to be trying to find an identity. Scratch that. The Wildcats have one. The Cougars are still searching for theirs. The final result at Arizona Stadium on Saturday night left a handful of exclamation marks for the offense on the home sideline and produced just as many question marks for the visiting offense. The Air Raid didn’t play up to par. The “Speed D” was even worse. After letting Arizona’s turbo-charged quarterback, Khalil Tate, waltz up and down the field to the tune of 146 rushing yards, the Cougars now have just six days to solve their defensive shortcomings before they face Stanford’s Bryce Love, the only player capable of beating Tate for Pac-12 Offensive Player of the Year. And they have to decide on a starting quarterback – potentially the last issue WSU thought it would encounter when the season began a few months ago. But the first priority is diagnosing what went wrong on both sides of the ball in the desert, where the Cougars all but wilted in a 58-37 loss to Arizona – a preseason pick to finish last in the South that’s looking more and more like a conference title contender. “We played dumb against a really good team,” WSU coach Mike Leach said. The Wildcats became bowl-eligible, improving to 6-2 overall and 4-1 in the Pac-12. The Cougars, 7-2 and 4-2, lost ground in the race for the Pac-12 North, but it’s nothing they can’t overcome with games against Stanford and Washington looming. There isn’t much room for error. On Saturday, the mishaps were wide-ranging. WSU starter Luke Falk, never quite in rhythm, led the Cougars into the end zone just once in seven drives. Five times, they were forced to punt. Another drive culminated with a missed field goal. Leach decided the offense needed a jump-start and made the gutsy move to pull Falk, his fourth-year starter, and insert the backup, Tyler Hilinski. The stunt worked for a moment – Hilinski led a nine-play, 75-yard touchdown drive capped by a 6-yard keeper to bring the Cougars within six points – just not in the long-term. Hilinski rushed for two touchdowns and passed for two more, but had more than a few reckless plays, throwing four interceptions and nearly fumbling on another occasion. 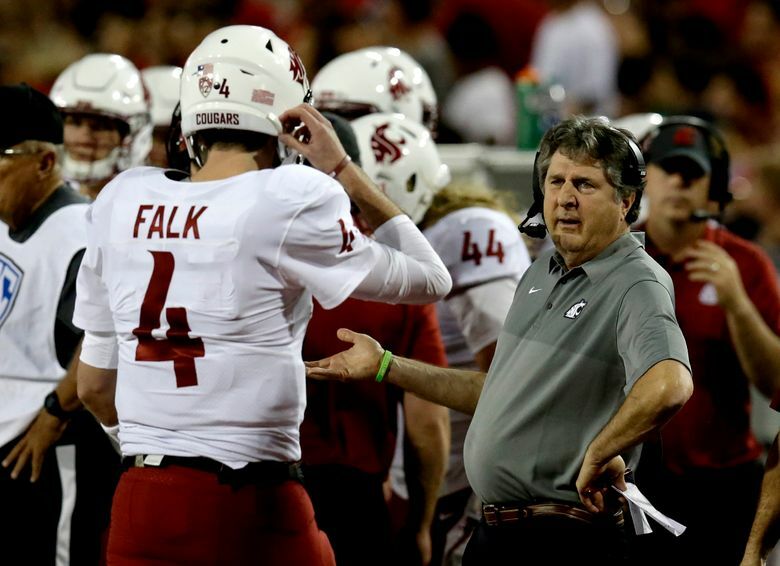 It was late in the second quarter when Leach replaced his record-setting senior with the redshirt sophomore. Hilinski had some good moments, finishing 45 of 61 for 509 yards. By comparison, Falk was 13 of 23 for 93 yards. But Hilinski hurt the Cougars more than once with his errant throws – and this wasn’t a day in which the WSU defense could recover. Arizona had explosive plays of 43, 48, 42, 82, 45, 62, 69, 49 and 68 yards. Tate or running back J.J. Taylor had a hand in all nine of those.